"It would be a failure by some of the political and intellectual classes not to know that, with modern economies, you cannot guarantee the prosperity of your people if you do not work for access to big markets." These were the words of President Yoweri Museveni during his keynote address at the first ever, Africa Now Conference, held in Kampala in early March, 2019. The President pointed to the great strides in economic growth which India and China had attained as a result of their accessing big markets. Over 1,000 delegates attended the Africa Now Conference on the theme, "Towards a secure, integrated and growing Africa", held at Uganda's main conference venue in Munyonyo. Among the audience were African Presidents and Vice Presidents as well as the Continent's top entrepreneurs, businessmen/women including Zimbabwe's Strive Masiyiwa of Econet Wireless; and United Bank of Africa guru Tony Elumelu, of Nigeria. Referring specifically to India and China to make his point on the significance of trade and markets to economic transformation, Museveni said each of these countries had a large enough domestic population of more than 1.3 billion people each, to guarantee a big internal market. Each of these countries however, could only undergo socioeconomic transformation when they opened up, starting with trading; followed by getting investments from the world. As a result of opening up, China's GDP which was $ 149.54 billion in 1978 today is US$12.24trillion. Similarly, India's 1991 GDP of US$278.4billion; now is US$2,848 trillion. Posing a rhetorical question to drive his point home, President Museveni asked: if China with a population of 1.3 billion people cannot prosper alone; nor India with a similar quantum of people, how can Uganda prosper with a population of only 40 million people? Within the East African and African context, he argued that supporting one another's prosperity by buying one another's goods and services is the correct way. "With our united market," he said, "we can, then, approach third parties such as the USA, China, India, etc., for additional market access to their markets, just like they have been selling in our markets for centuries." "Once we know this, then we must accept the free movement of goods and services by removing taxes (tariffs) and non-tariff barriers (border restrictions, road-blocks on trade routes, complicated licensing procedures, etc). It is only when the goods produced by the factories access big markets that they can make profits." 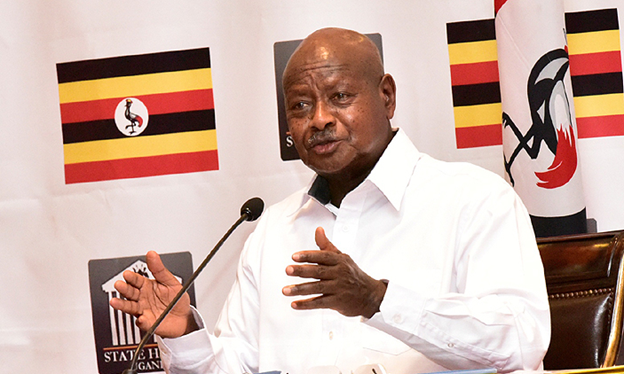 The President said that many factories were opening up in Uganda now; due to availability of a wide range of raw-materials of all types including agricultural, minerals, forest products, etc. Furthermore, Uganda is peaceful, being troubled by none other than "some parasite public officials who try to get bribes from investors". He highlighted the country's friendly business atmosphere; and the ease of doing business assisted by a fully convertible currency. On the labour front, Uganda had in hand an educated youth who are a potential work force which easily trainable. And one of the most crucial needs for industry, electricity, was now available in adequate quantities. Museveni stressed that these advantages, together with on-going work on reducing transport costs, make the country a highly viable investment destination; which is on the verge of take-off. The President's speech cohered with the main thrust of Africa Strategic Leadership Centre, a Kampala-based foreign think-tank, which is to help identify and understand the existing binding constraints to Africa's progress and to identify leadership and institutional ingredients to address such bottlenecks.